- There are other people in Vietnam with the same name as you - I found someone on Vietnam's Got Talent who was singing and playing the guitar. My name is pretty common. - Can you first tell me about your musical background? What kind of family did you grow up in and how did you come in contact with music? I was born into a family of actors. My father and mother are performers in traditional theater. - Can you tell me more about this traditional theater? I imagine it has singing, dance, a narrative, and artworks. Was it a travelling theater group? My father was an actor at Nha Hat Cheo Ha Noi and my mother was an actor at Nha Hat Tuong Trung Uong. There is also Cai Luong and these three groups are maintaining the traditional arts in Hanoi. All three of these are in the same area in the city, and I grew up there. Therefore Vietnamese traditional music was always close to me since I was born. To explain it simply, Trung Uong is closer to Chinese opera and Cheo is similar with costumes and stories but the songs are different. - Where is the instrument that you play, the đan tranh, used? It is used in all three. Vietnamese traditional theater and traditional music is very close and the acting is combined with music. I grew up in an environment where there were both. - Did your parents want you to follow their steps or become a professional đan tranh player? I think they wanted me to become professional but they never told me to play the đan tranh. The three of us agreed that I would be good at this instrument, so I started at the age of nine and continued to go on to studied at the Hanoi conservatory. - Can you tell me about the đan tranh? Originally there are 16 strings on the đan tranh, but now there are some with 19 or 21 strings. In these instruments the added strings are in the lower register. - There are many zither type instruments in the world, I am sure you know the Japanese koto. With koto there is a technique to move the bridge while playing. Is this done on the đan tranh? There is no such technique in the traditional playing style, but I research on how to extend playing techniques on the instrument so sometimes I play in this way. - When you studied at the conservatory did you study both traditional and Western music? At school I only studied traditional music. However I did study Western music theory. - How did you come into contact with contemporary music? In 1998, I won the highest national prize in a đan tranh competition and traditional Vietnamese music. My career as a professional musician in traditional music began from here. In 2000, I met with several Vietnamese composters who returned from abroad and I started to be involved with more cutting edge music. They were very interested in doing something new with the đan tranh, and we started to think together on what we can do. They wrote compositions for the đan tranh, and as a result we both learned a lot. On my side, I discovered new ways to look at my instrument and my world was opened. That was my first experience. - Who were those composers? Nguyen Thien Dao and Ea Sola. These two composers had a very strong influence on me. They are each male and female but both French Vietnamese. Both were educated in France and worked there, but midway in their careers, after 40, they came back to Vietnam. They wanted to do something new with Vietnamese traditional instruments and music. Nguyen Thien Dao passed away two years ago, but Ea Sola lives between France and Hong Kong and sometimes stops by Hanoi. She is originally a choreographer so she directs every aspect in her performances. Around 2000, things started to develop in Vietnam. Not only people who had connections to the country but also more people from abroad started to visit, including musicians from other countries. When they wanted to collaborate with local musicians, the offer would often come to me. I was able to develop by working together with these musicians and trying new things. There is no one who is doing what I do, so of course I had no one to study under and I had to find my own path. Recently not only are there more people coming to Vietnam, but I also have more chances to go abroad and play with musicians in each country. - I heard that you are researching about gestures in Vietnamese traditional music. Can you tell me more about this? In 2006, there was an exchange program between the National Conservatory of Vietnam and the Music Academy of Malmo in Sweden, and I went there to teach traditional Vietnamese music. I wanted to continue to study so I started my Master's in 2012 to investigate the relationship between gestures and gender within Vietnamese traditional music. Only until about 100 years ago, only men played traditional music in Vietnam. However if you turn on the TV, women are now always traditional music. First I was curious why this is. Then I noticed that the gestures are completely different when women play compared to the men. The movement is different and the facial expressions are different. There is a message there that they are trying to convey. I wanted to research this as an academic topic. - The composition you played in Tango titled "Vodou vibrations sounds of memories of fields and burdens living in translations and broken bows balancing on plateaus while speaking to one self and scratching the surface of the raft while drifting away (2014)", also had distinctive gestures. You mentioned that this was made in collaboration with a choreographer. Yes, this was originally a composition that is 36 minutes long and I made it with Swedish choreographer Marie Fahlin. In this piece is the gestures are what make the musical composition. I look at the gestures and try to think what kind of instruments and sounds to make. It is an interactive piece between sound and movement. This work is of course related to my research but also very strongly reflecting on the rules of gender. In the performance there are many layers that combine gentle gestures like when we touch flowers and water with more violent gestures. - You mentioned that "Vodou vibrations" is a site-specific work. Can you tell me more about this? The venue in Tango was in an old elementary school but why did you choose the classroom to perform the piece? I used the word "site-specific" because in the world of dance and choreography, it is important which direction the dancer faces within the space. Also this work includes elements of video, text, photo, paintings, and recorded sound, but the most important is the space that it is in. At Art Camp Tango I only played the first five minutes of the piece, but that is because I couldn't play the rest. I didn't have a dancer and there was not enough space. In the part I played, I do not play the instrument in the traditional way, but I place it upright and hide myself behind the body of the instrument. It has a very strong visual effect where you cannot see me but only the instrument and my hands. It looks like a mysterious ritual and I prepare the instrument with dangerous objects like knives and nails, so I used the word "vodou." I chose the classroom because out of all the spaces that I could use in the elementary school, it was the only space that had a dark wall. I wanted to have a strong visual effect where when I wear dark clothes and play hidden behind the instruments the hands would look like they are floating, and for this I needed the dark backdrop in that room. - The sound that you played for the piece, were they composed or did you improvise? It is somewhere in between. It is not composed in the sense that I had a score and I had to play it exactly the same, but on the other hand I was not freely improvising on the spot. There is a framework and the gestures are decided so I am playing according to sequence of these. It is predetermined in that sense, but it is not as strict as to play exactly to a score. - Can you tell me how familiar you are with improvising? Are there elements of improvisation in Vietnamese traditional music? If there is, are those used in the way that you play today? Or if there are not, how did you familiarize yourself to free improvisation? Yes, there are elements of improvisation in Vietnamese traditional music. There are no scores in traditional music but there is what I call a framework and the details are improvised. In traditional music the repertoire is passed on to the next generation orally and that is the framework, but how to arrange the smaller details are up to each performer. The quality of the performer is measured by how much one can create variation within the framework, decorate the sounds, and change the tempo. In that sense improvisation is very important in Vietnamese traditional music. I was used to this kind of improvisation, but the free improvisation that we played at this festival is very different. There was no framework or any rules, so it was not like anything that I have done before. To meet someone new that day and say: "Hello. Ok let's play" and have to play in front of an audience is very challenging for me, but also I had a lot of fun. - So did you not play improvised sessions before AMF? No, I have many times. I mentioned that I started to challenge myself with new things since 2000, and one of them was to play with many different people outside of the context of traditional music, and I have played many improvised sessions. - At the Fukuoka Asian Art Museum and yesterday's Sendai Mediatheque, there were moments where you didn't play and were just listening to others play. When I asked why you told me that the sounds around you were already beautiful enough that you felt like you didn't have to do anything. You added to that saying that also since your instrument is acoustic, your levels and dynamics are weaker than the other instruments and that no one would hear you. 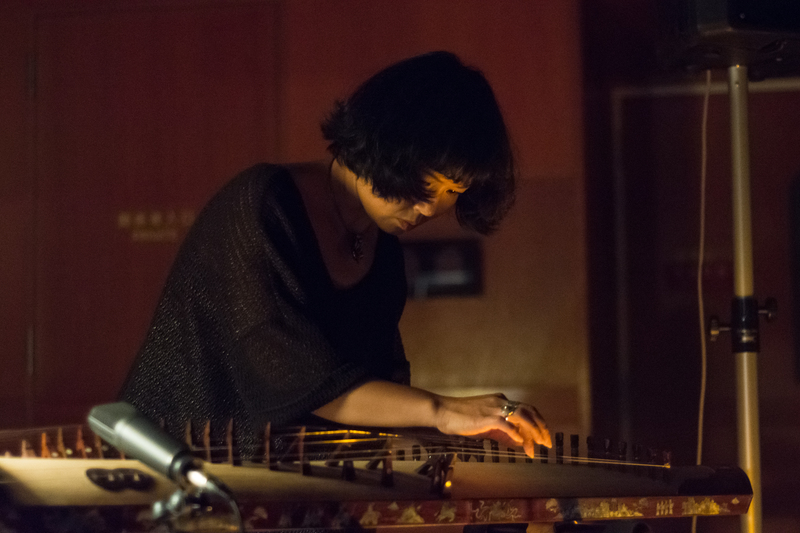 At last year's AMF, there was a musician who played the guqin (Natalie Alexandra Tse), but she had effect pedals to amplify her sounds. Do you ever consider this direction with your instrument? I have considered using pedals and electronics to amplify my sounds, but that is not just for making my sound loud. If I wanted to make my sounds louder I just need to turn up the volume and in Vietnam there is an electric đan tranh, so I could just use this. This is an instrument that you can just plug a cable and it makes a very loud sound. But I am interested in actually transforming the sound, and I would want to use the electronics in a way that would open new possibilities on my instrument and towards sound. - What was interesting is that last year Natalie used her volume pedals less and less as the tour progressed. During this AMF, I was very impressed how you played with everyone just being acoustic. Yes it was very challenging to play with everyone at AMF. There are electronic musicians and DJs and everyone plays with many different things and I only had my acoustic instrument. But it was really fun. The curation and formats we played in were very thoughtful and it was wonderful festival.